The U.S. Customs and Border Protection Agency announced Thursday that they had seized 254 pounds of fentanyl over the weekend near Nogales port of entry. The Agency claims this is the most massive single Fentanyl bust recorded in CBP history. According to the reports a young 26-year-old Mexican truck driver was found with more than 640 pounds of meth and fentanyl worth $4.6 million. During a press conference held at Mariposa port of entry, agents revealed that early Saturday morning when the drugs were discovered the driver was instructed to undergo a second inspection. During the second inspection, the scan detected anomalies in the trailers’ floor. The canines that were inspecting alerted the officers to the odor of 400 packages of illegal substances. The seized packages contained more than 100 packs of fentanyl, worth more than $3.5 million, which were mainly in powder form but also in pills. The reports state, the meth seizure was the third largest discovered at Arizona ports of entry and contained more than 300 packages worth $1.18 million and weighing 395 pounds. According to the authorities the driver is currently being held in federal custody and charged with two counts of possession with intent to distribute. 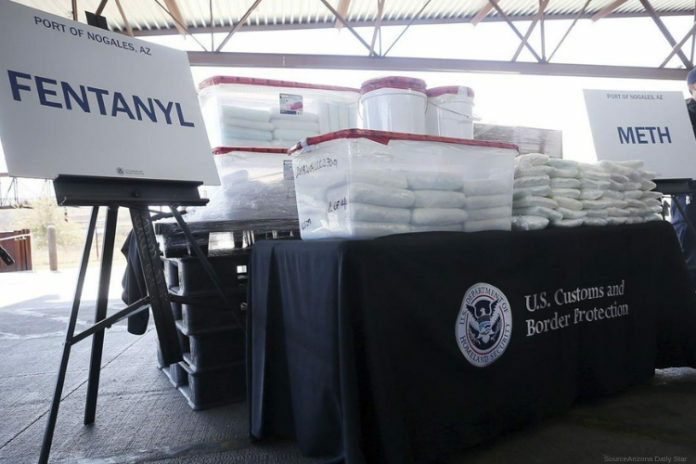 As reported by Drug Enforcement Administration the last massive U.S. seizure of fentanyl had been in August 2017 when it seized 145 pounds (66 kilograms) of the powder in a Queens, New York, apartment that was connected to the Sinaloa Cartel. Before that, the largest recorded fentanyl seizure was 88 pounds (40 kilograms) busted from a pickup truck in Bartow County, Georgia. In the recent decade, Mexican traffickers have been flooding the border with drugs, smuggling them into the United States mostly hidden in passenger vehicles along with tractor-trailers. The most polluted areas seem to be ports of entry in the Nogales, Arizona, and San Diego areas. Doug Coleman, the DEA’s special agent in command for the Phoenix division, congratulated the officers for the size of the recent bust, claiming that it was not the result of any intelligence from his agency but instead “pure, old fashioned police work” by the officer who pulled the truck over. “It was a cold hit” based on the agent’s hunch, Coleman announced. The federal Centers for Disease Control and Prevention states in a recent report that fentanyl is now the drug most frequently involved in fatal overdoses across the country, responsible for more than 18,000, or nearly 29 percent, of the 63,000 overdose casualties in 2016. There have been no other arrests at this time. This investigation is ongoing.